Are you ready to swim away into a world of underwater adventures? It’s a Polymer Clay Fish … Tutorial! STOP LAUGHING AT MY FUNNY FISH! Okay, seriously, I know she looks funny … but there’s a reason this fish looks this way. You see, I wanted to recreate the “flying fish” from the Flying Fish Market (Pike’s Place Market) in Seattle. So this fish is made to look like she’s just been “flung” through the air and of course you can’t be flung through the air without your tongue falling out of your mouth, I mean really, I don’t think that’s possible … do you?! 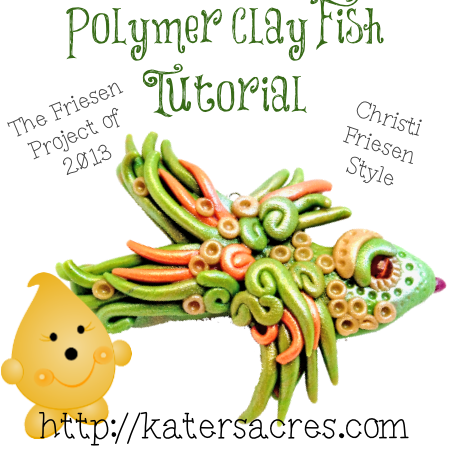 Okay … never mind, onto the polymer clay fish tutorial then, shall we? These tutorials are written and designed to be used in conjunction with the Beyond Sculptures Book 3, Under the Sea and can be found on pages 32-37. Please note that for my fish, I made it very differently from Christi’s instructions as I wanted a completely different look for his fins, more like a whimsical “flying fish” than a real fish. This is one of the easier projects, as you can tell by the brevity of my description; however, with this concept, like the Dragon before it, you can have LOTS of fun making yourself a sea filled with flying fishes, dancing fishes, fishes with hairdo’s (or hair don’ts), and even balding fishes (gasp!). Your projects can be anything you want them to be. Initially when we began this journey I was teaching you the same as Christi’s book did, however, as time goes on you will notice that I may vary my tutorials every now and again. Make sure what you are making is something that YOU want to make! Don’t make it just because it’s this week’s project. If you don’t like fish … make a Turtle instead, or another Dragon … whatever you want. My strongest and best advice is to make what you are inspired to make. I’ve have gotten mixed reviews from everyone participating on the Friesen Project. Please leave your thoughts, comments, ideas BELOW in the comments section. I need to know from you what kind of tutorials you’d like me to do. Straight from the book with oodles of pictures. I love what you are doing. You always encourage people to do their own thing not to try and be carbon copies of someone else. Like has been said earlier people don’t have to do them and there free! I look forward always to your stuff-fun, relax and let your creative juices flow!!!! I seem to be in the minority! I still consider myself a newbie and just like all the help I can get. I’ve never sculpted anything EVER before Christi’s class in Sept of 09. So I’ve been doing this for less than year and I like my hand held at the beginning, lol. Again, just my opinion, but I’m happy with the project, no matter what! First of all, you can’t please everyone – this is a FREE thing for folks to do and no one has to participate if they don’t want too. Keep that in mind. Very involved, step by step tutorials and Straight from the book with oodles of pictures. I can’t imagine complaining about it at any rate, tho. Keep up the GREAT work and thanks for all you do. I like the idea of doing your own thing. What you do may or may not be what “I’d” do, but that’s the WHOLE POINT. If you just repeat what’s in the books, where’s the fun? I don’t own every book, but I know Christi’s basic style. I didn’t participate much this month because of things going on here in the “real world”, but I LOVE seeing everyone’s pictures. The really simple, quickie lessons are not interesting for me; I’ve been playing with clay for 20 years – if that’s all you’re showing, you’ll lose me. But if you put a twist I didn’t think of (flying Pike’s fish made me giggle – I’ve been there!) then you’ll keep me around. I have to agree with all above comments, although i do not have any of the books, i was thinking i will see if i want to after trying a few of these but now I do not feel the need, this is a wonderful project and I love the way its going! thanks Katie! I can understand that some people might like a step-by-step tutorial but imho you can get those from Christi’s books? Even if you don’t have all the books (like me), you can still figure out the basic parts and go from there to make your own creation. It has been said by people who reacted before me, I love how you give your own “schwung” to things. Like this weeks fish tutorial, it shows how you can take Christi’s style and make it your own. Just as Beth said, we shouldn’t want to be mini-Christies or mini-Katies but use the style(s) to develop our own style with a wink to Christi and you. I also love how you encourage people to make their own thing, like that you don’t *have* to make a fish because it is on this week’s menu; if one would like to make a shell and dress it up that is great too! I enjoy your writing. I would not change that at all. As for tutorial I think it is nice to have a different take on the same concept like this weeks different fish. The idea is not to become little mini me Christies. We should be learning from you and her to create fresh lively sculptures in our own evolving styles. I think Jan D. Is someone who is already doing that. I am enjoying this whole process and am really glad you started it. Thanks for doing this. I like seeing you use Christi’s book as a jumping off point, then using your own ideas. I like your tutoring, because it’s you in your way. I like the way your are writing. I needed a smile this morning and you gave it to me when I read your funny Disclaimer NO LAUGHING AT MY FISH!!!!! I have all the books of christi, so if I want to follow her way I can follow her steps, so I don’t need you to do a very involved tutoring. I think it’s nice to have both, to have too different way, and to be able to go back and forth to create my own. Thank you for your all your work.